Item # 312293 Stash Points: 395 (?) This is the number of points you get in The Zumiez Stash for purchasing this item. Stash points are redeemable for exclusive rewards only available to Zumiez Stash members. To redeem your points check out the rewards catalog on thestash.zumiez.com. Represent your crew with the Society6 Babe Gang Sticker. This all black sticker is highlighted by large white block letters that read "babe gang" for a strikingly original look. 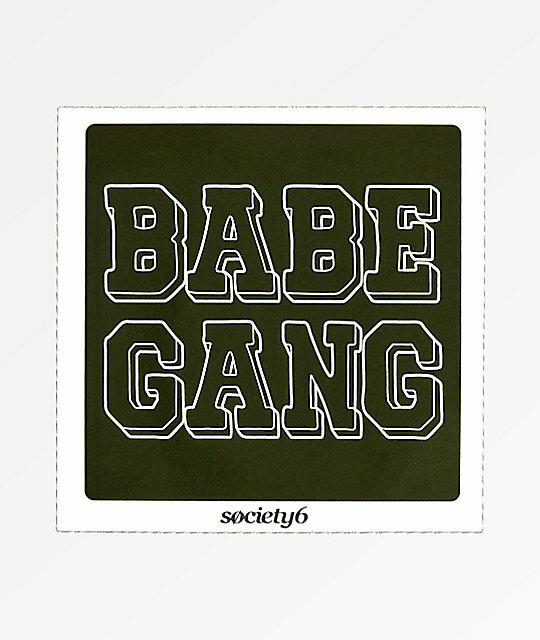 Babe Gang Sticker from Society6. All black sticker with the word "babe gang" in white block letters. 3.5" x 3.5" | 8cm x 8cm (approx. ).